Dublin is a big city with lots of big city sights and sounds. Tall, decorative street lamps, double-decker bus noise, bicycle stands—the kind where you can rent a bike here and return it elsewhere, a therapeutic clinic on the corner where you can remove your cellulite, and the clip-clop of the touristy horse and carriage. Perhaps all common in the major European capitals, except for the seagulls. 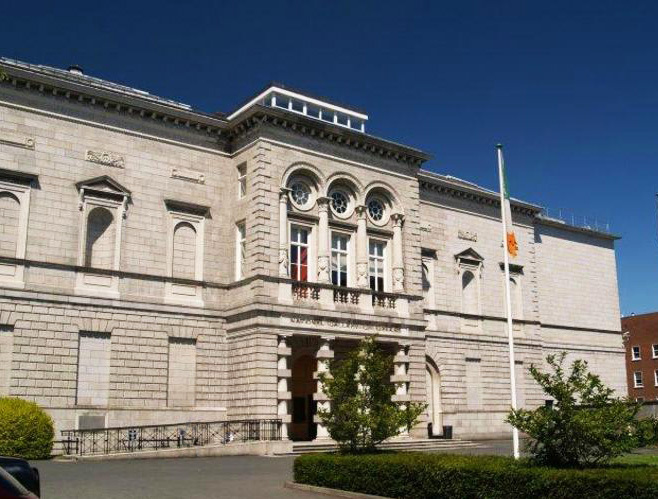 But today I am searching for a remarkable work of art that is not inside this museum — but a short distance away — in the elegant Georgian park known as Merrion Square. You don’t have far to go along the tree-lined path. Then bang! 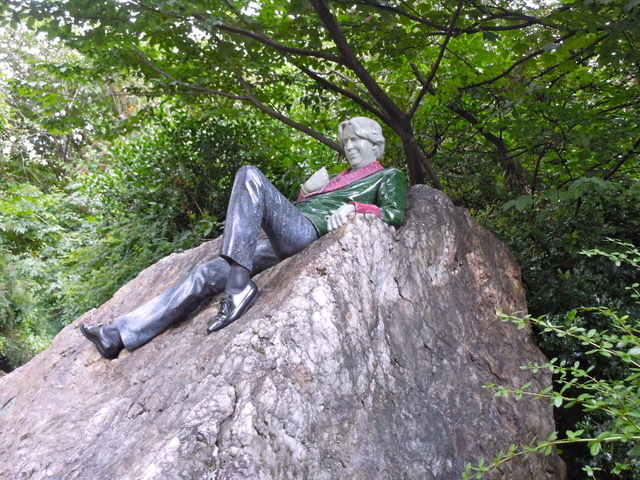 The colorful monument of the flamboyant Oscar Fingal O’Flahertie Wills Wilde (1854-1900) looms powerfully before you. 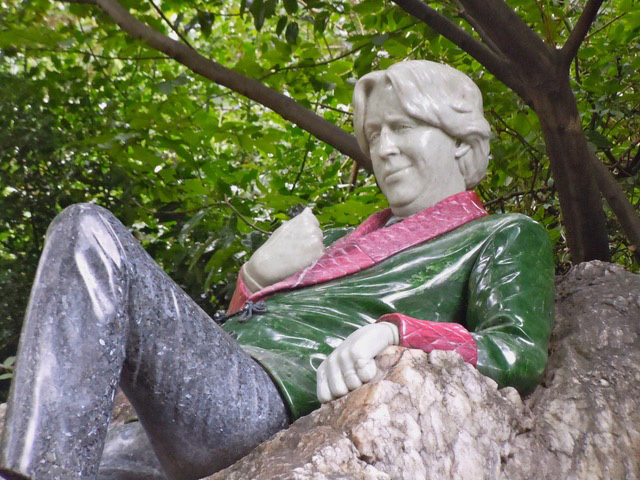 This larger-than-life-size, three-dimensional portrait of Oscar Wilde features him sprawled high on a thirty-ton piece of white quartz, with a devilish look on his face. The rock is situated across the street from his childhood home, where the family moved in 1855. He is staring across the road to where he lived, as his family were key-holders to the enclosed park, and he would have played often in this very spot as a young boy. This is a truly beautiful work of art of a man who himself adored beautiful stone and materials. Starting with his shiny black, laced-up shoes made of black Indian granite, the stone sculpture of the dapper dresser takes on more color with his green jade velvet smoking jacket, adorned by quilted pink cuffs and a shawl collar, made of a beautiful stone from Norway. His face and hands are expertly carved from the pale jadeite that the artist brought back from Guatemala. It is a very hard stone, carved with high quality diamond tools and polished to perfection. Two rings are visible on his left hand. Radiating both the wit and insouciance of Wilde, there is not even a hint that the life of this brilliant man came to an all too early tragic end at the age of forty six. An oval-shaped bronze plaque informs us that the work is by Danny Osborne and was commissioned by Guinness Ireland Group. It was unveiled by Merlin Holland on October 28,1997. 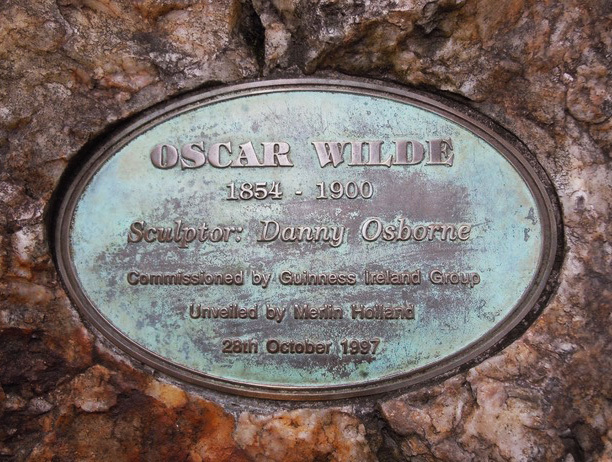 Osborne reveals in a 2010 interview that the two stone pillars accompanying the sculpture, which are covered in famous Oscar Wilde quotations, were chosen by people associated with the Irish art world and written in their own hand. Some are in block letters, some in almost illegible script. “Beauty has as many meanings as man has moods. It seems to me we all look at Nature too much and live with her too little. A cynic is a man who know knows the price of everything and the value of nothing.